The 6th edition Luneta to Tagaytay 60K Ultramarathon is happening this February 23-34, 2019! Save the date! 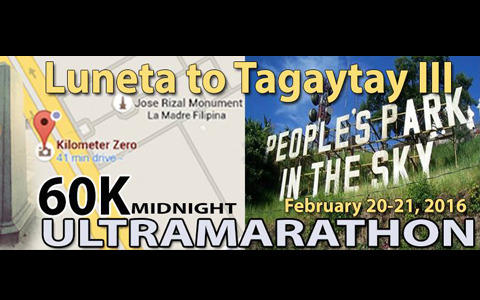 The 3rd Luneta to Tagaytay 60K Ultramarathon is set to take place on February 20-21. The race will start at Luneta Park & end at People's Park in Tagaytay.